CSIRO recently announced that energy from the ocean could supply 11% of Australia’s demand by 2050. That is enough to power a city the size of Melbourne. It is a bold claim, but it’s time for Australia to look at the sea differently. The World Energy Council recognised the potential several years ago when it listed Australia’s southern coastline as one of the world’s best sources of wave energy. Predictability and power are what make the ocean competitive with wind as a power source. It also makes it the new frontier for renewable energy exploration. The federal government has set a target of 20% renewable electricity generation by 2020. CSIRO modelling shows the potential for ocean energy to make up a significant part of this figure. Our investigation used engineers, oceanographers and economists to review what devices are being developed, trialled and commercialised around the world. We consulted with Australian companies already working in this area of exploration, and examined potential environmental and social impacts. What types of ocean energy are there? Tidal energy is where the sun and moon pulls at the ocean and fills bays and estuaries every day. Placing tidal turbines individually or in a row would take advantage of these vast water movements. Likely sites include northern and western regions and the Banks Strait off the east coast of Tasmania. Ocean thermal energy uses the temperature difference between the surface and deep ocean. This disparity can be used to condense and vaporise a working fluid to drive a turbine. A prime location would be off the Queensland coast which has a differential of about 10 degrees between surface and abyss. There are deep water currents in the ocean which might be captured using enormous turbines anchored to the sea floor. Such currents exist off the east coast. There are also thousands of kilometres of coastline in Australia where waves dump the concentrated energy of the ocean. And it is this – wave energy – which holds the greatest potential for Australia. Australia has an advantage as an island that borders the Southern Ocean. This plays home to the largest global source of surface waves which are constantly being generated night and day, summer and winter, under its powerful storm systems. To supply 20% of Australia’s total electricity demands by 2050 it would be necessary for wave energy power stations to produce 46TWh. Depending on the technology, this could take as little as 150km of coastline – or more if wave energy extraction was reduced to avoid any changes to undersea sand and rock movement. Our study selected seven possible areas, each stretching 50km along the southern coast. The CSIRO identified Western Australia, Victoria, South Australia and Tasmania as having the best wave resources. These also happen to be near our largest energy markets. However in these areas there are differing demographics and existing energy resources which may affect take-up of wave energy. Tasmania’s west coast alone is nearly 300km of constant waves which produce more than 12 times the state’s current consumption of energy each year. But its population size and the existence of hydroelectric sources mean that it’s not likely to need wave energy. That is unless it’s as an industry that can be linked via Bass Link, the high voltage DC line to the mainland. Victoria, though it lacks the powerful wave resource of Tasmania’s west coast, is predicted by CSIRO modelling to have the greatest amount of wave energy. Victoria has high energy demands and needs to replace its brown-coal fuelled electricity supply with low-emission energy sources by 2050. Consideration of environmental impact will be important in calculating the spread and mix of wave farms. Little research has been done to look at the effects both negative and positive on the ocean environment. The size, number and distribution of large-scale wave farms would depend on the availability of the coastline. It would be in competition with protections in place for a variety of reasons. Marine protected areas, native title and land rights, shipping, tourism, recreation and real estate, aquaculture and fisheries, mineral exploration and mining, and defence and security would all come into consideration. Wave farms on remote coastlines could supply power and promote mineral exploration in as yet un-mined regions. Farms could help calm waters near off-shore oil rigs, they might also promote fish breeding or protect coastline from erosion. What makes wave energy particularly worth investigation is that it’s much less intermittent than wind, and is more predictable. Waves arriving on our coasts were generated hundreds of kilometres away and days ago, by storms that we can track. To maximise that advantage, it will be important to assess the cost of transmitting the energy on-shore. It’s also critical to reduce the cost of ongoing maintenance of equipment that must operate in tough ocean conditions, in the face of corrosion and bio-fouling. The economics of energy extraction, storage and transmission will decide the take up of ocean energy, assuming environmental and social impacts are acceptable. Photovoltaic solar arrays and wind turbines have permanently changed our landscape and the way we see the sun and the wind. 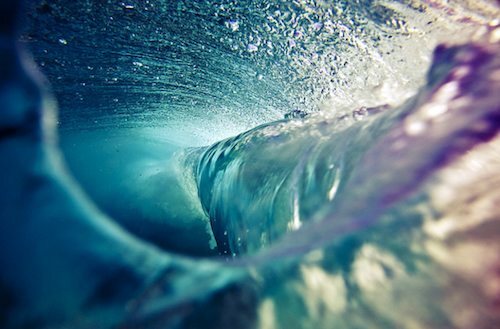 Wave energy will change the way we look at the sea. Jenny Hayward does not work for, consult to, own shares in or receive funding from any company or organisation that would benefit from this article, and has no relevant affiliations. Image: Sunova Surfboards, Could waves and ocean currents hold a key to a renewable energy future?